Julie Canman set out to determine how the cell division process — microtubules stretching and then cleaving in some precise location — was regulated. 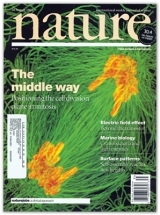 Her research landed on the cover of the August 28, 2003, issue of the journal Nature. Right now, somewhere in the world, some man or woman or child is no doubt at the seashore, poking into the rust-colored shell of a crab. “A dead crab?” they wonder, ignorant about the nature of skeletons. Most people, says Carolina biologist Jennifer Taylor, aren’t familiar with molting, the process by which a crab wiggles free from a shell that’s become too small as the crab’s inner organs have grown. That discarded shell on a beach — the exuvium — gets easily mistaken for the remains of a dead crab. While the exuvium is the crab’s skeleton, the crab lives on, with a quickly hardening new and larger shell forming around its body. But even biologists, it turns out, didn’t completely grasp the significance of the molting process. At least not until Taylor, a graduate student, published her research in Science in July 2003. Seven weeks later, Julie Canman, at the time another Carolina graduate student, published a paper in Nature. Her research into the way cells divide showed that key instructions for how one cell becomes two come from the chromosomes. Two students with two keen observations, published as two journal cover stories in two months. Not a bad summer for Carolina. And not a bad summer for science. Taylor, an unassuming fifth-year biology doctoral student, was reading through the journals a few years ago, searching for a research idea. She noticed a recurring observation about lobsters and other crustaceans: even after they’ve shed the exoskeleton — the shell that is their armor — they’re able to move about and defend themselves. But how? Think about your own skeleton. If suddenly you discarded your bones, your muscles would have nothing to contract and expand against, and you’d just melt into a blob of skin, muscle, and cartilage. Even though crustaceans have a skeleton on the outside, biologists figured that without it, the crab and lobster muscles couldn’t work. So how could a lobster move around and even vigorously defend itself when it was supposed to be just a motionless blob? Taylor’s hypothesis was that marine crabs were switching from an exoskeleton to a hydrostatic skeleton and back again. She knew that crabs swell their body matter with water until the pressure cracks open the shell at precise sutures. Blue crabs are perfect for studying this process because their fins display a blue streak that lengthens as molting comes closer. Taylor was able to measure their movements after molting but before the new exoskeleton had hardened. She discovered that the waterlogged, shell-less crab became a walking hydrostatic wonder. She was right. “I’m coming at this from a biomechanics perspective,” says Taylor, who came to Carolina from southern California to study how marine invertebrates move. Other biologists missed the importance of molting because they were interested in the physiology of the crab instead of the mechanics of the process, she says. “No one had considered the possibility,” Kier says, “that some animals could alternate their form of skeletal structure.” Some of his colleagues suggested testing Taylor’s hypothesis by simply poking a hole in the newly molted crab to let the fluid inside drain out. They predicted that the crab wouldn’t move without its inner fluid. But puncturing a crab shell wasn’t such a simple step. So Taylor chopped off half a claw from each crab and watched as the fluid drained and the severed claw went limp like an empty glove, Kier says. This demonstrated that the newly molted crab could not support itself without its fluid. Now Taylor needed to record the pressure and force in an undamaged claw, so she connected to the claw devices that record force applied by the muscles along with the resulting pressure from the muscles’ response. With that, she was able to capture telling measurements of a crab’s movements. Before her experiments, biologists assumed that the crab skeletal system was static, she says. Her results changed that. Now, a biologist looking at a molting crab will understand the wonderful, round-trip metamorphosis from exoskeleton to hydrostatic skeleton and back again. 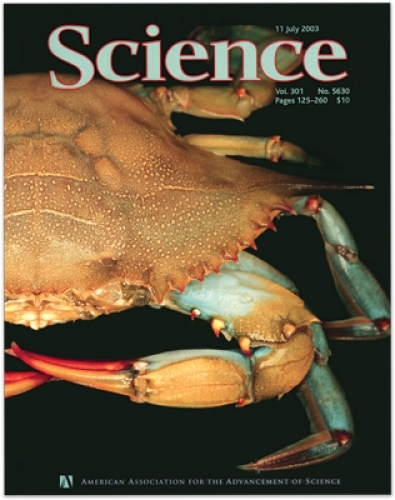 Prodded by Kier and Joe Thompson, a postdoctoral fellow at the time, Taylor submitted a short paper, “Switching Skeletons: Hydrostatic Support in Molting Crabs,” to the journal Science, which published the paper — her very first — and featured it on the cover. Soon after, the shy Taylor was fielding phone calls from newspaper reporters up and down the eastern seaboard. “This will really have a big impact on her future career,” Kier says. Taylor has warmed to the task of talking to the media, but she says she was most excited by eleven-year-old Matthew Burgner’s interest in her research. (See Show-and-Tell.) Like Matthew, Taylor is also intrigued by insects such as beetles and cicadas. Most arthropods such as crabs and beetles, she writes, grow by molting. Perhaps some insects switch skeleton mechanisms, too. “For instance, molting dragonfly nymphs swallow air to distend the gut. Changing from a rigid to a hydrostatic skeleton suggests that, in arthropods, the skeletal support system is not as static as typically thought.” Next time you pick up a cicada shell, ponder that. “It’s kind of promising to know there are still questions to be asked about organismal biology,” she says. Taylor and Kier were funded by grants from the National Science Foundation and NASA, and that suggests her findings may have far-off ramifications. The space agency is interested in robotics, she says, and this new understanding of the crab’s unique hydrostatic skeleton, and its ability to switch to and from an exoskeleton, could inform future robot development. Kier is working closely with Clemson robotics engineer Ian Walker on biologically inspired surgical tools, and a DARPA grant has him contemplating a hydrostatic skeleton with an infinite number of joints. Julie Canman is squarely in that same realm. While Taylor was studying how crab skeletons come apart, Canman was studying how animal cells split. Canman spent seven years at Carolina earning her doctorate. She says she also found her scientific interest while in her undergraduate studies at the University of Wisconsin. A professor had introduced her to the classic experiments of Raymond Rappaport, a biologist who manipulated sand dollar eggs to study cells as they divided into two. Canman decided she wanted to learn more about how cells divide, and she found her way to the lab of Carolina biologist Edward D. (Ted) Salmon, an expert in microtubules. Microtubules are the tiny cylindrical protein polymer structures inside cells that play an important role in mitosis, in which a cell copies its own DNA and divides into two daughter cells. Microtubules help pull apart those copies to create the daughters. If a cell doesn’t divide in exactly the preordained place, however, the aberrant cells can lead to cancer. “It’s long been known that you can target cancer cells by getting rid of the microtubules,” Canman says. Chemotherapy drugs such as Docetaxel inhibit the microtubules so the cancer cells can’t create more of themselves. Most healthy cells in an adult don’t go through the division process. Cells in your hair follicles and in the lining of your intestines do, though, and that’s why patients on chemotherapy feel nauseous and lose their hair. Canman set out to determine how the division process — microtubules stretching and then cleaving in some precise location — was regulated. “I wanted to see if a bipolar spindle was required,” she says. That meant testing the prevailing assumption about mitosis. A bipolar spindle is a type of microtubule that, with one end connected to the chromosomes and the other attached to the dividing wall, helps push and pull the cell apart. Canman collaborated with Salmon and fellow students Lisa Cameron and Paul Maddox. Together they spent six years finding their answers, developing new tools along the way to test their hypothesis that the chromosomes were providing some key chemical instruction to the microtubules. The team created a “mutant protein” that kept the cell’s light switch on, so to speak, as well as improving the microscopic imaging that allowed them to see single microtubules. The clincher to understanding mitosis, Canman says, came to her only after repeatedly watching her movies of the cell dividing. Sometime around the hundredth movie, she says, a tiny detail jumped out at her. One end of a half spindle was clearly connected to the chromosome. So, a bipolar spindle wasn’t necessary. Canman knew that Salmon — “a perfect mentor” who welcomes calls at home — would mirror her excitement, so she interrupted an important meeting to tell him about what she’d found. The team had previously published a paper about the role of microtubules in cytokinesis in the journal Current Biology. Now that they had more answers, they submitted a letter to the journal Nature (“Determining the position of the cell division plane”). When the journal came out, Canman sent a friend to a bookstore in Portland to buy three copies for her. “I’m proud of myself,” she says. Canman has moved on to the University of Oregon, where she is a postdoctoral researcher searching for more answers about cell division. Taylor, meanwhile, has begun her doctoral research with the hypothesis that land crabs use the same skeletal mechanisms as marine crabs. Their efforts at understanding the shape shifting all around us — on the beach and under the microscope — help us shed, little by little, the casings of our knowledge. Like our dividing cells, our knowledge multiplies. Anton Zuiker was a student who formerly contributed to Endeavors. From the Winter 2004 issue of Endeavors.